By definition, monochromatic interiors are these spaces that are decorated in different shades, tints, and tones of one dominant color. People are usually excited about mixing colors in their living spaces yet sometimes less is more. There are rooms that definitely look better when just a single color is used for their décor, of course, in varying shades. If you think such spaces are boring, lacking in charm and personality, you are totally wrong! Would you like to try with a monochromatic room? Actually, you can use any color, just go bold and creative. However, you need to follow some simple rules. Focus on your favorite color or any other one that works well in the chosen space. Incorporate several different shades, add different textures, including reflexive surfaces, to create a layering effect, bring in a pop of color, and voilà, the monochromatic magic is achieved! Your will have a space with an adorable, dynamic, sophisticated, textured look. Note that color can be introduced by literally anything, even a beautiful vase of fresh flowers or a fruit arrangement can do the job. Although monochromatic designs work well in any space, as they create peaceful interiors with a sense of simplicity and balance, monochromatic solutions are a popular choice for living rooms and bedrooms. Consider that keeping to a monochromatic color scheme helps to easily change the look of the space by simply changing the accent color and adding new shades of the dominant color or new textures. Green is a relaxing color directly related to nature. It stands for balance, spring, and rebirth. It symbolizes prosperity, freshness, and progress. While in Japan green is regarded as the color of eternal life, in Portugal it is the color of hope because of its association with spring. 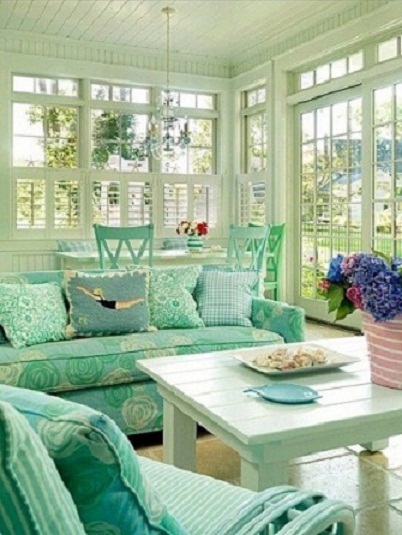 Above, a multi-functional screened-in porch in mint green. An array of prints, patterns, and textures help create a space where to relax in style. Cut flowers add pops of color and extra freshness. This flooded in natural light porch is all about charm and coziness . What a way to add a spring vibe! Red is a powerful, hot, energetic color, so if you want to draw attention, red is the perfect option to do so. Associated with movement and excitement, it is not a recommended option for nurseries. Above, a living room with a distinctive feminine vibe. 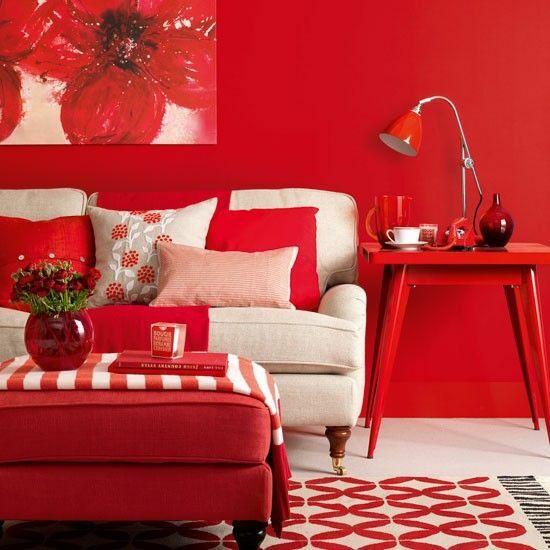 An oatmeal sofa and floor balance this bold red space. Floral accents and a flower arrangement add some extra softness. Throw pillows and an area rug bring in texture and visual interest. Dramatic yet so elegant! Do you think it is too bold? Blue is said to be the most universally liked color of all. Generally, it has a positive effect on human’s mind and body. 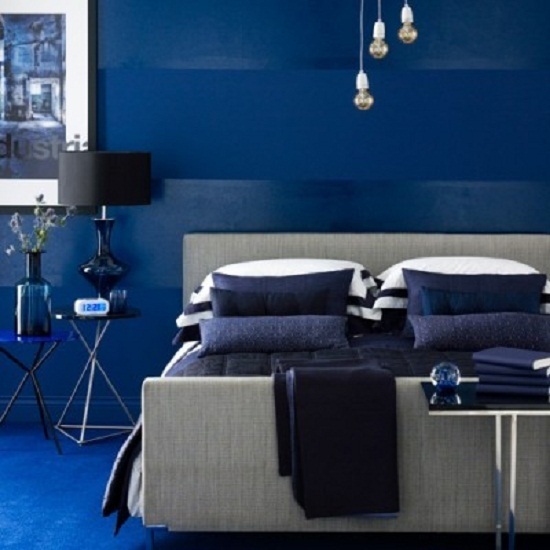 Being a calming color, blue is a favorite choice for bedrooms and restrooms. In addition, it encourages clear thoughts and creativity, which makes this color suitable for kid study areas. In the picture above, a master bedroom in indigo. Reflective surfaces, bedding, and throw pillows add texture. A piece of wall art brings in extra visual interest. Definitely an elegant, sophisticated space with personality! A combo of red and blue, purple is calmer than red. Throughout history, purple has always been associated with royalty, nobility, and prestige. It denotes mystery, magic, power, and luxury. 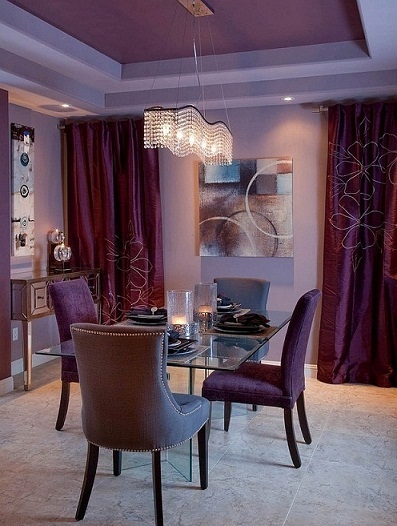 Deep purples create sophisticated interiors with a luxury, elegant look. Above, a magnificent dining room in purple. Reflective surfaces and a unique chandelier add extra texture and sparkle. Wall art brings in visual interest. Definitely a space that exudes luxury, elegance, and sophistication! Yellow is all about the sunshine, happiness, and optimism, enthusiasm, and creativity. As it creates a welcoming first impression and raises the spirits and vitality, its use is recommended in entries and kitchens. Above, a lively kitchen in yellow. Flowers and fruit arrangements add extra freshness to the room. 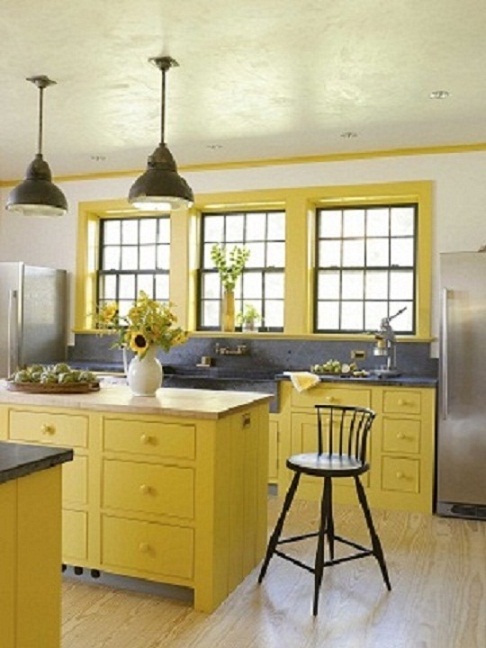 Some yellow paint can definitely enliven any space! A combo of red and white, pink takes the energy and passion of red and blends them with the pureness and innocence denoted by white. Usually associated with love, romance, sensitivity, and tenderness, pink is unquestionably the favorite girls’ color and the perfect choice for any girl’s space. In the picture above, a fascinating bathroom in various shades of pink. Textural walls and sparkling tiles add visual interest and appeal. A casual tulip bouquet brings in freshness and extra touches of romance. 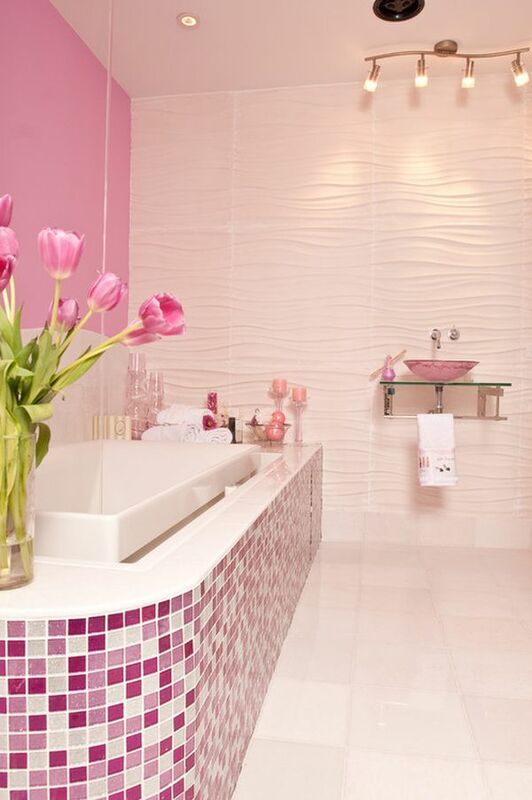 It is definitely a bathroom with a distinctive feminine vibe, which has tons of charm and personality. Wondering how to add a jolt of energy to your living space? Orange is what you definitely need. An energetic, expressive, and vibrant color, a combination of yellow and red, orange isn’t as aggressive as red, but is still full of vitality. When people visualize it, they usually think of sunsets, turning leaves, citrus fruits, tropics, and blooming flowers. 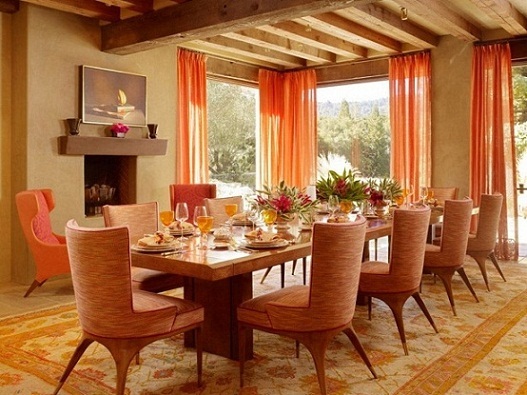 As it is believed to stimulate appetite and communication among people, orange proves to be an excellent option for decorating dining rooms and outdoor entertainment areas. Above, a mind-blowing formal dining room in orange. A fireplace, floor-to-ceiling windows, exposed wood…Flower arrangements add color and freshness. This space exudes so much warmth, elegance, and appeal! Associated with all things natural or organic, brown is a neutral, earthy color, which creates feelings of wholesomeness, stability, and reliability. 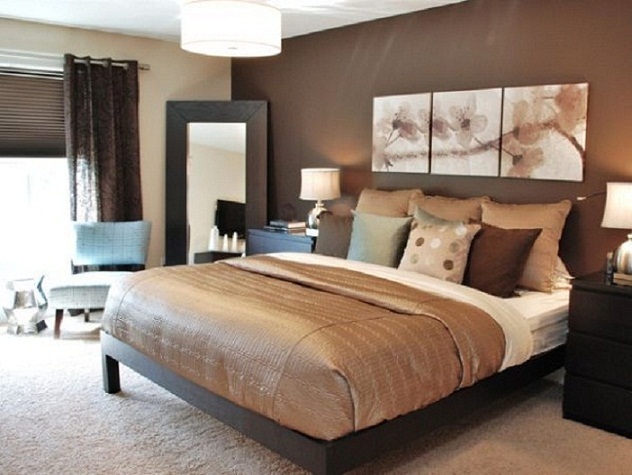 Generally, spaces in brown are with a relaxing, comforting atmosphere and exude warmth, coziness, and calmness. Note that this grounded color has a number of variations, each of which when used to create a monochromatic space lends it a different look and creates a different ambiance. Above, a traditional master bedroom in chocolate brown. An eye-grabbing piece of wall art and an oversized floor mirror add visual interest. This space unquestionably exudes warmth, calmness, coziness, elegance, and sophistication. Associated with light, purity, and cleanliness, white is serene and peaceful . All-white is a chic, versatile décor solution suitable for any kind of living space, from bedrooms to living rooms and kitchens. Furthermore, all-white designs work well with any style – from traditional and French Country to contemporary and futuristic. Adding texture and pattern and incorporating varying materials and reflective surfaces helps lend a layered look and create comfortable and balanced spaces that have depth and are pure simplicity and perfection. On a side note, white can hide all visual imperfections, especially in older houses. Consider that keeping a space all white helps easily transition from season to season by simply changing the seasonal color accents. Above, an all-white master bedroom with charm and personality. Floor-to-ceiling windows, curtained walls, a hanging chair…A bed throw, a pair of matching hot-air balloon-shaped table lamps, and hanging accessories add texture and visual interest. Definitely a whimsical space! Creating a monochromatic interior is all about playing with various shades, tints, and tones of one single color. Go bold with patterns and textures, they offer an easy and affordable way to lend any space a layered look and add visual interest. Another way for bringing in extra doses of interest is introducing pops of color. Plus, they will pull the space together and will give it a designer feel. What’s your opinion about monochromatic interiors?